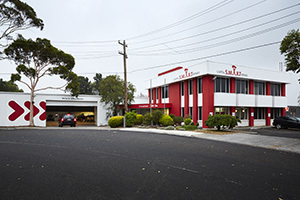 We are located off Whitehorse Road, between Springvale and Surrey Roads. If travelling towards the city on Whitehorse Road, turn left onto Terracotta Drive where you will see Natuzzi and Berkowitz furniture on the corners. Also look out for the BP Service Station on Whitehorse Road where Terra Cotta Drive is on the opposite side of the road. When dropping off your car enter the roller door on the right hand side of the workshop and park in one of the dedicated assessment bays.